Senior leadership from the eighteen Provincial Education and Sports Services and the eight Teacher Training Colleges will gather in Vientiane from 30th October for a high-level briefing on the new National primary curriculum development and implementation, as well as the selection of the teacher training teams. 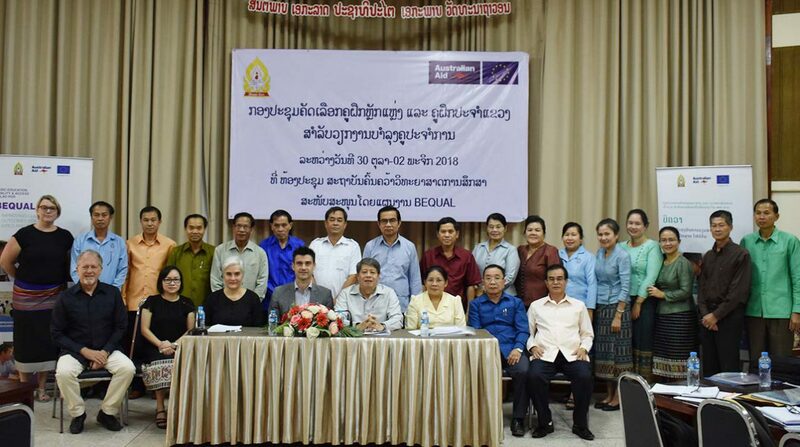 Since 2015, the Ministry of Education and Sports of Lao PDR (MoES) has been developing a new national primary curriculum with support from the Australian Government and the European Union through the BEQUAL program for eight primary subjects, and from JICA for the mathematics. The new national curriculum and associated teaching and learning resources will make an important contribution to the quality of the learning outcomes of all Lao children. It will help more primary Lao girls and boys achieve functional literacy and numeracy, and acquire life skills, opening new opportunities for their future. The teams at the Research Institute for Educational Sciences and Department of Teacher Education are working hard to prepare textbooks, educational materials, teacher guides and training materials to facilitate the successful implementation of this new curriculum. It will start in September 2019 with Grade 1 and finish in 2024 with Grade 5. It will be a huge task which will need commitment and support from all stakeholders, from national to school level. One of the main changes with the new curriculum will be the new pedagogical approach, active learning, which aims to help children learn better. Students will learn by participating in the class, collaborating with each other, engaging with the materials, and experimenting through activities. They will learn by doing and spend more time applying their new knowledge. Detailed teacher guides, including scripted lessons, will be provided to each primary teacher for each subject to help them organise their teaching and utilise an active learning approach. 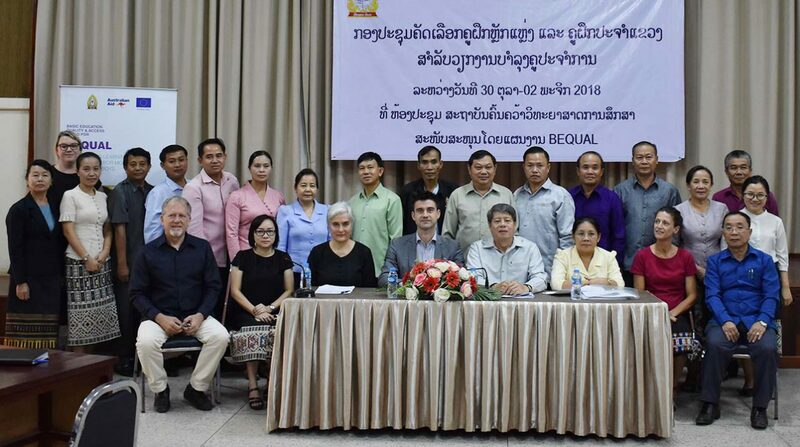 The development of the new curriculum is the first step to improving education for all Lao children. The second step is the provision of in-service teacher training and support, which is essential to ensure that teachers can successfully implement the new curriculum. 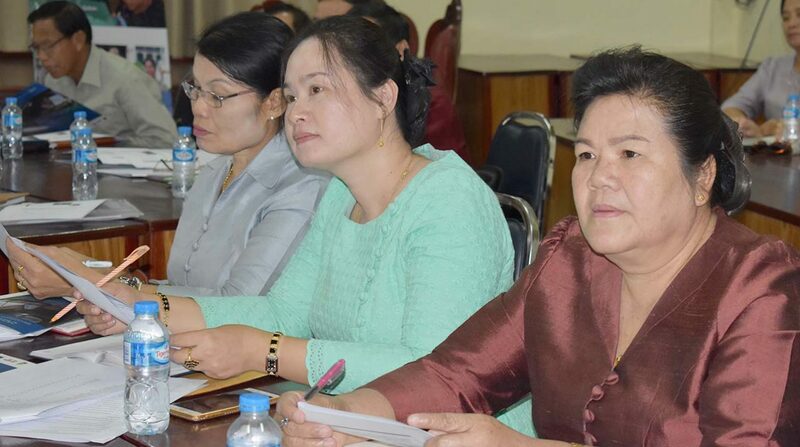 To prepare the transition and fully equip teachers for this change, senior leadership from the eighteen Provincial Education and Sports Services and the eight Teacher Training Colleges (TTC) will be in Vientiane this week to participate in the selection panel that will identify the national and provincial teacher training teams. There will be approximately 45 Master Trainers and 450 Provincial Trainers selected through a merit-based process. They will be deployed in July and August 2019 to train all Grade 1 primary teachers, Pedagogical Advisors, and primary principals nationwide. Skilled trainers are a key part of the provision of good quality teacher development. The selection panel will select trainers based on their skills in key areas, including primary teaching experience, specific subject knowledge, or experience in training/facilitation. The panel will be looking for education professionals who are committed to improving teacher quality and supporting teachers in the classroom. The ideal trainer teams will be diverse, with members drawn from across MoES at all levels, including national, provincial, TTC, districts and school level. The trainers will be nominated officially in November and the first round of capacity development training for the Master Trainers is already planned for December 2018.